It is postulated that patients who exhibit a maladaptive pattern of right ventricular remodeling with dilatation, fibrosis, and decreased contractility also demonstrate downregulation of α, β, and dopaminergic receptors and increased sympathetic activity.10,11 As such, nuclear imaging with iodine-123-metaiodobenzylguanidine (123I-MIBG) can potentially play an important role in the management and risk stratification of these patients. In support of this notion, data have suggested that sympathetic function is altered in patients with PAH. In a study of 55 patients with pulmonary hypertension including 28 with PAH, heart-to-mediastinal ratios (H/M) were lower in pulmonary hypertension compared to control subjects. In addition, H/M ratios > 2.0 were associated with improved survival.12 Takao et al. have also shown that right ventricle-to-left ventricle (RV/LV) uptake ratio of 123I-MIBG correlates well with mean pulmonary pressures.13 More recently in a small study of 21 patients with PAH and chronic thromboembolic pulmonary hypertension (CTEPH), patients with PAH had lower 123I-MIBG lung uptake compared to subjects with CTEPH and controls.14 Contrary to the above findings, clinical studies treating PAH patients with beta blockers have not demonstrated improved outcomes.15 It is possible that the right dose and/or type of beta blocker has not been tested. In this issue of the Journal, Gimelli et al. studied 13 patients with newly diagnosed PAH and 11 patients with pulmonary hypertension associated with non-ischemic dilated cardiomyopathy (DCM) using 123I-MIBG uptake and cadmium-zinc-telluride (CZT) technology. The authors employed the 17-segment left ventricle model and scored the percent uptake in the right ventricle relative to the interventricular septum. For this purpose, a semi-quantitative software (Corridor4DM, INVIA; Ann Arbor, MI) was used after manual reconstruction of the right ventricular images. Due to artifacts in the inferior wall, only segments 1, 2, 3, 4, 8, 9, 13, and 14 were reported and those were designated to correspond to the lateral right ventricular wall. The authors found no difference in H/M ratios between the groups, but noted that patients with PAH had significantly lower lung-to-mediastinal (L/M) ratios. The study also demonstrated that right ventricular perfusion and early innervation were significantly higher in PAH than in DCM and that RV/LV perfusion and innervation ratios were directly correlated with right ventricular thickness and diameter. Despite its small size, the study is novel and of potential clinical importance. Lung-to-mediastinal ratios in combination with H/M values are associated with all cause mortality and rate of events in patients with heart failure.16,17 Previous studies from the authors’ group have also shown the feasibility of performing simultaneous LV perfusion and innervation with a CZT camera.18 However, this is the first study to apply this concept to the right ventricle. It is well established that possibly due to prolonged transit time, heart failure and/or elevated left ventricular filling pressure result in increased lung uptake of myocardial perfusion tracers.19 This is likely to be an important factor in the increased L/M ratios seen in the DCM patients in the present study as the NT pro-BNP levels averaged 13,213 pg/mL in the DCM patients and only 259 pg/mL in the PAH patients. As pulmonary transit time should also be elevated in the PAH patients, this would seem to further support the postulate that low L/M ratio in the PAH patients may reflect impaired pulmonary endothelial function. The main limitations of the study are the small sample size, significantly higher body mass index in the DCM group, and the poor quality images in some of the cases. There are no prior data applying the 17-segment model of the left ventricle to the right heart. Further, all patients studied had some evidence of right ventricular hypertrophy and it is unknown if such analysis could be performed in those with normal thickness. 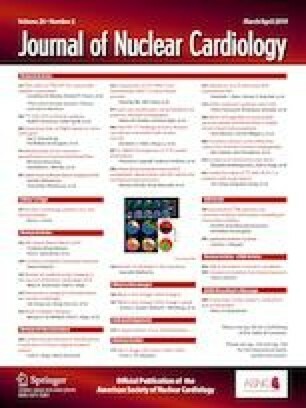 Given some patients with PAH are diagnosed quite late into their course and there has been no improvement in time to diagnosis over the last two decades, a modality that can aid in earlier diagnosis may be of significant importance.20 Additional larger studies are needed to answer these questions, validate the findings presented by the authors, and demonstrate reproducibility.